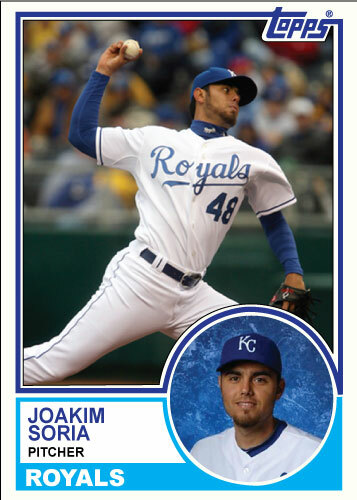 I posted this Joakim Soria 1983 Topps design a few days ago. I think it is the strongest looking card I have put up on the site. If you are familiar with the 1983 design you know that all cards are portrait style(no sideways shots) and the circles vary from right to left. I’m not sure if there is a method to which card got the inset picture on the right or left or if it was completely random. I wanted to do a set of 1983 Topps for the Kansas City Royals so I made a design with the circle on each side. I took it one step further and made a sideways design for 1983 Topps. It didn’t work. I thought trying this worked well with 1980 Topps set I did. They looked nice as a sideways desgin. 1983 simply doesn’t. I have put examples of 4 Joakim Soria 1983 Topps cards above. One I love, one that is almost as good, one that looks weak and one that is terrible. I used the same pictures to illustrate these four cards. If I had chosen different picture they might have fit the sideways cards better. The picture is not the only issue with them however. It also has way too much white space in the middle under the main picture. I could eliminate this by moving the name on one line and team and position on another line but then I am changing the card design all together. I like to come up with a landscape design for my cards because it really opens up the options for pictures that I can use, which can be very troublesome to find at times. This design however will have to stick to the basics. I have posted several cards on the site and it is about time I posted about music. 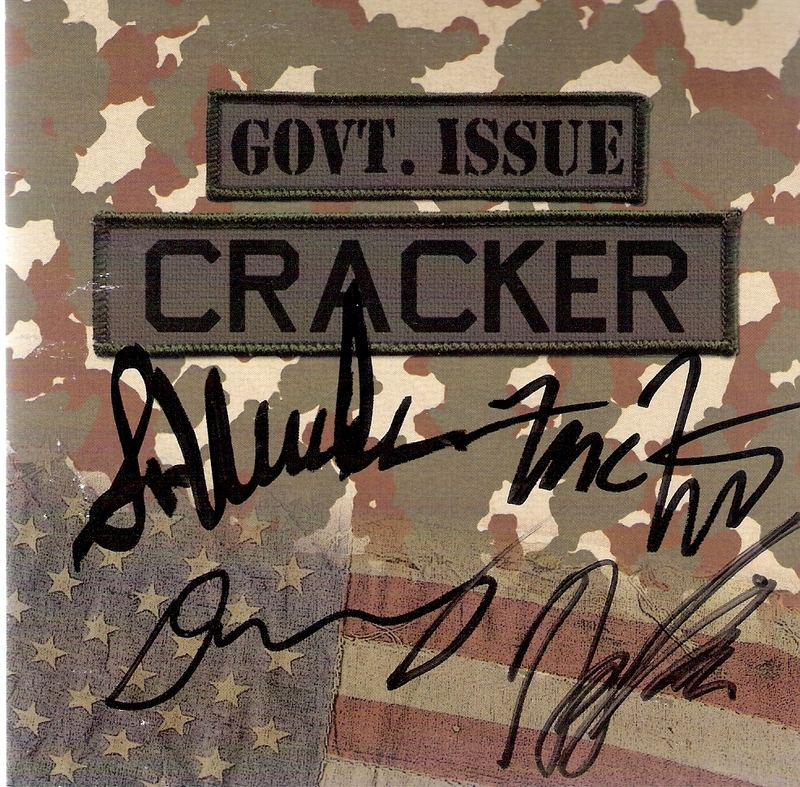 Cracker is a band that is criminally under-rated. They have a strong following, appropriately called crumbs. They are a fiercely loyal fanbase that keeps the band moving forward. David Lowery is the lead singer and has a great worpress blog: 300 Songs It is great for any music fan, whether they like Cracker or not. I strongly encourage anyone to read the blog and especially buy the records associated with the band. The core of Cracker is David Lowery, also of Camper Van Beethoven, and Johnny Hickman. Johnny is one of the more approachable musicians I have ever met, David is a little more distant. Johnny has always been willing and excited to talk to fans from my experiences.They are a great live band and are worth the money every time. Cracker put out a self released greatest hits sometime in 2010. I was able to pick it up and get it autographed at a show in Kansas City in July. What’s missing from this picture? Johnny Hickman’s signature. That is Camper Van Beethoven guitarist Greg Lisher’s signature in the bottom right hand corner. Johnny wasn’t at the show and Greg filled in admirably. It wasn’t quite the same without Johnny but it still was a great show. Signatures from the top left read: Sal Maida, Frank Funaro, David Lowery and Greg Lisher. Here’s one I am pretty damn proud of. 1983 Topps was a great design. A great clean looking card, one of only a few sets to use and inset picture on the front of the card. I like the colors as well a nice mixture of light blue and a purplish blue with plenty of white to balance it out. The inset picture is normally something I don’t like much. I don’t like the 1984 Topps design near as much as the 83 design. It had the inset picture as well but it was square along with square lettering and led to a very clunky looking card. In contrast, 1983 Topps is a smooth design. Another interesting thing about this set is that the mugshot picture varied on different cards; it would sometimes be on the left and sometimes be on the right. I have used Soria as my model for many of the card designs because he is a Royal and will be a Royal for at least a little longer it appears. I knew Zack was on the way and didn’t use him, and there are plenty of nice pictures of Soria as well. He is also one of my favorite all-time Royals. I saw him in person when he had his really good stuff and it was one of the impressive things I have ever seen on a baseball field. Overall, good pictures, good looking card and a really impressive result. Look for a complete “2010 Royals Roster” set for 1983 Topps like I did with the 1980 set. Time for a little winter cleanup, Greinke is gone. I’m angry about it right now, so I am cleaning out the closet. Here are three Topps cards I have made already. They likely could be the last for quite a while. The Chiefs beat the Rams today so as promised, here is a Chiefs set. 1985 Topps football by Topps is a very simple card, one of only a few black bordered cards. Not a great looking set but a nice clean look to the cards. One of the easiest sets I have re-created. 1993 Donruss was a great looking set; nice white border, simple design, nice pictures, full color team logo..so what was missing? How about a George Brett card? The 1993 Donruss set contained a whopping 792 cards and 28 Kansas City Royals cards, but did not feature the Hall of Fame Royals legend. The set would have came out after the 1992 baseball season, admittingly a down season for Brett; he batted .285 with 7 homers and 61 RBIs, for Brett’s standards anyway. He even played the next season so I see no good reason Brett wasn’t in the set. Donruss even made a card of him the next year in 1994. 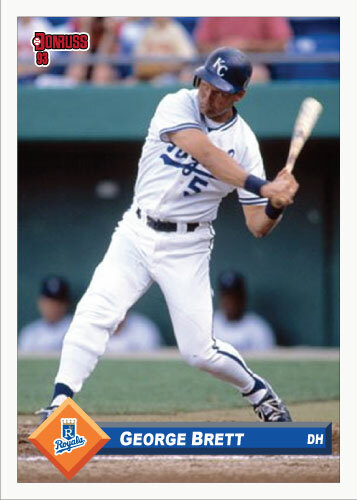 To try to rectify the situation I have made a custom card for George Brett for the 1993 Donruss set. The missing George Brett 1993 Donruss card. Here are the rest of the pitchers. It’s a shame that Soria gets lumped in with Greg Holland and Phillip Humbar but I wanted to finish posting these and start getting other cards up. I only have one to post from this set, Ned Yost. Saving the best for last I guess. I will post it along with my three favorite cards from the set.